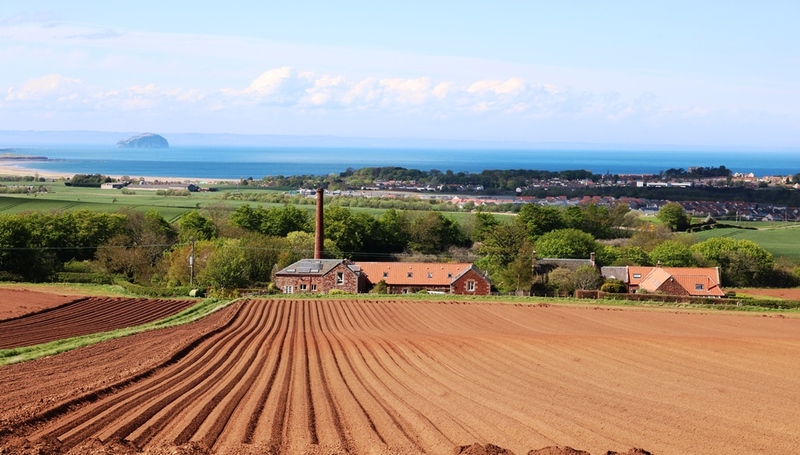 On a recent walk, we left the car at Wester Broomhouse, a farm at the top of a hill from which you can look back over the town of Dunbar. We then walked past Oswald Dean, scene of the first Battle of Dunbar in 1296 and on up towards the foot of Doon Hill, scene of the second Battle of Dunbar in 1650. Doon Hill is also famous for its Dark Age Settlement (good photos) which is worth visiting if you are near Dunbar. Unlike on New Year’s Day (blog post) our walk did not take us to the summit of the hill, but we walked around the base of the hill and back to Spott Farm. From the base of the hill, we looked down newly planted tattie (potato) fields. In the first photo below, you can see the elegant, flowing dreels (rows) of potatoes. In Scotland, if someone gets lost or takes a wrong turn or is looking in the wrong place, we might say that s/he is “up the wrong dreel”. I love seeing the smooth bare dreels, as in a short time, little green shaws will start to emerge, grow large and the field will be a mass of green. 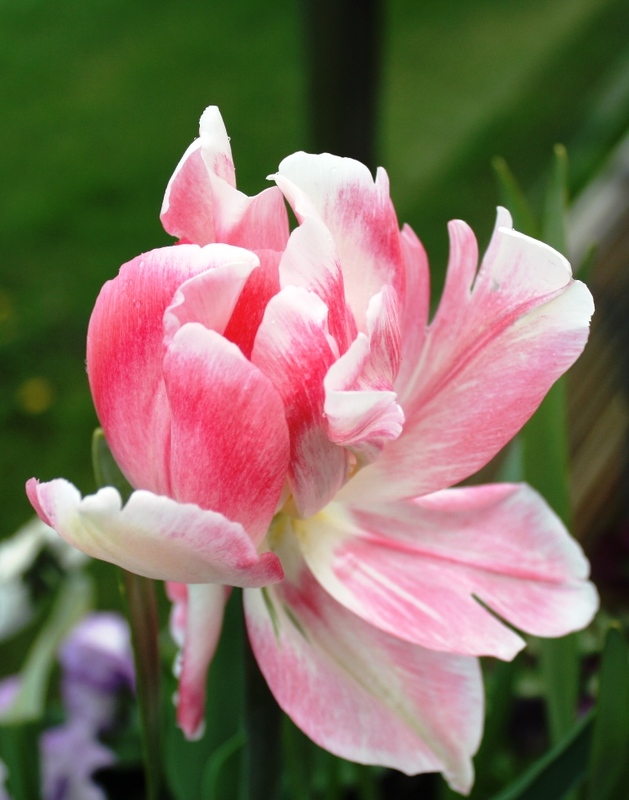 The brown dreels are like newly-formed and unpainted pottery, admirable in themselves. At the end of the field, you can see the group of houses known as The Doonery and one still has the large chimney, which would have formerly been part of the farm buildings here. 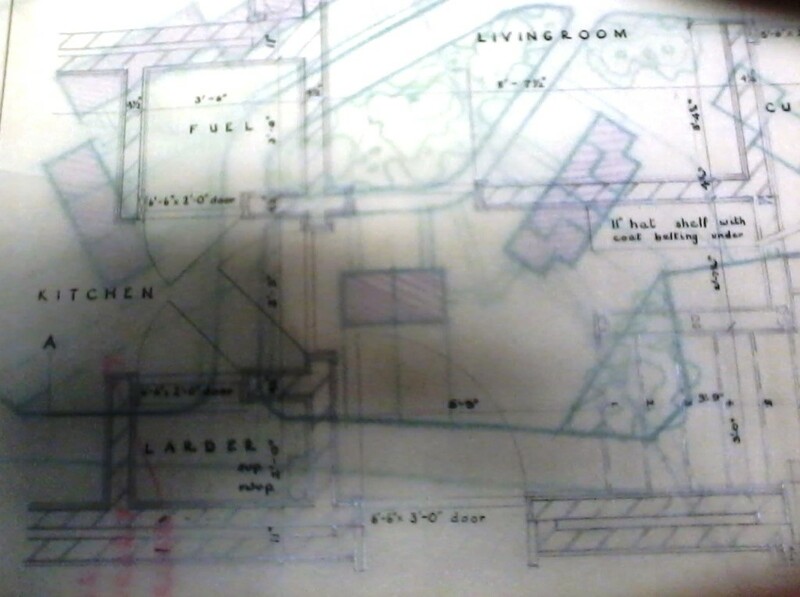 When some farm machinery was steam-driven, chimneys were needed. 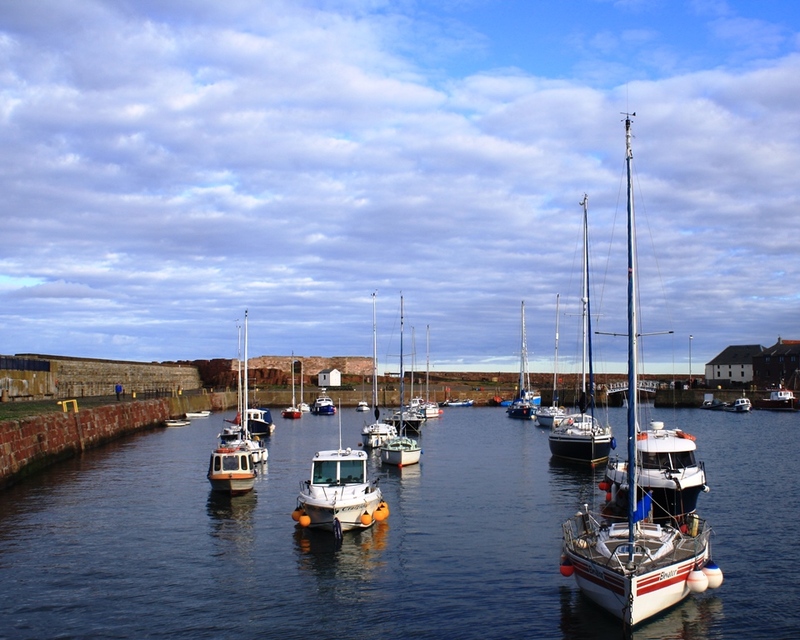 To the right of and above The Doonery, before the sea, is my home town of Dunbar. To the above left, you can see Belhaven Bay (good photos) and the Bass Rock on the other side of the Firth of Forth. 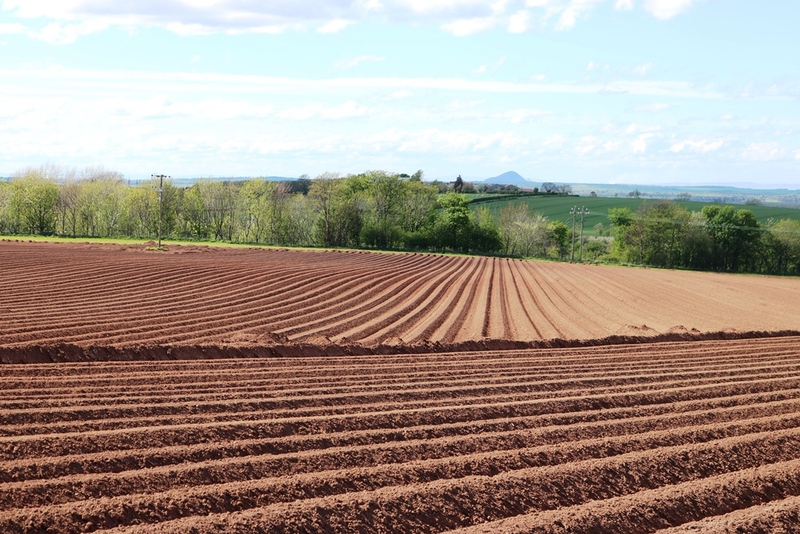 In the second photo below, you can see how the farmer has planted groups of tattie dreels side by side. I like the juxtaposition of the dreels going in different directions. I’m sure that there is a practical reason for the farmer doing this e.g. to increase the productivity of the field, but I like to impose some aesthetic quality on to the farmer and imagine that s/he might have seen the artistry in these patterns. The little hump that you can see in the middle/right of the photo, above the dreels and the green fields beyond, is North Berwick Law (good photos). Later in our walk, we went through Spott Farm (good photos) which is a very well maintained farm , with a beautiful clock below a turret on one of the buildings, as well as the magnificent Spott House, with the present façade done in the 1830s. We then went back down past the Doonery, and on the road towards Oswald Dean (known locally as Oasie Dean), we could firstly smell and then see the extensive clumps of wild garlic. 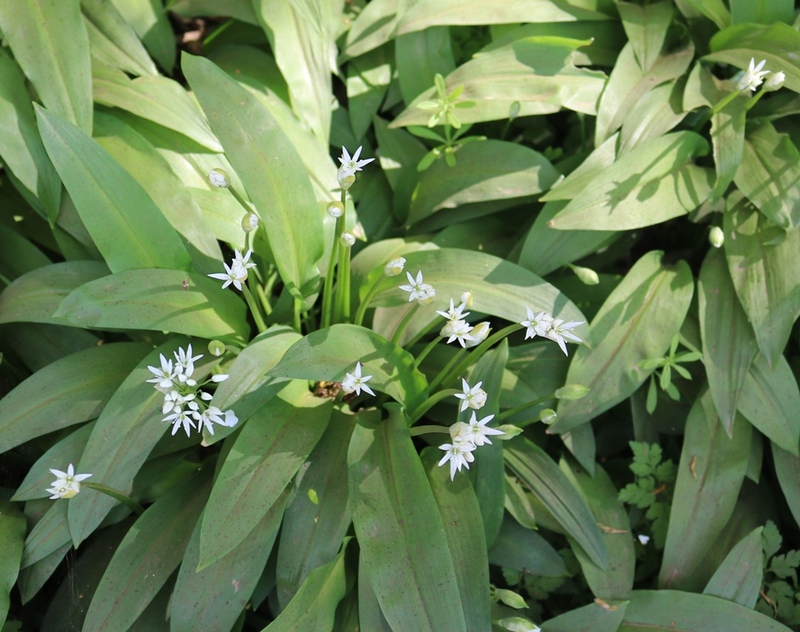 In the first photo below, you can see the emerging flowers which shoot up from the mass of green leaves on the wild garlic plants. 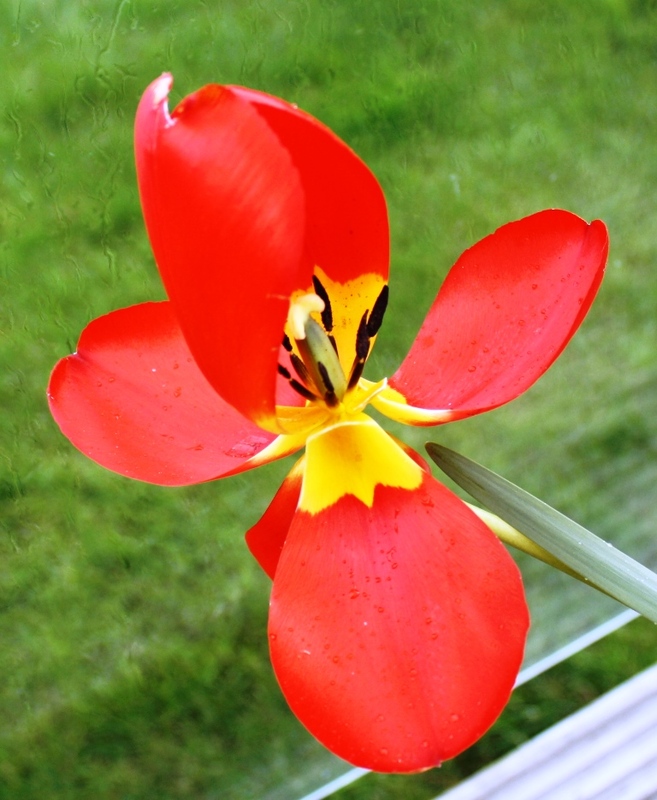 Intriguingly, the photo also captures the shadows of the flowers on some of the leaves. Here is a joyous burst of brilliant white amongst the plethora of lush green leaves. 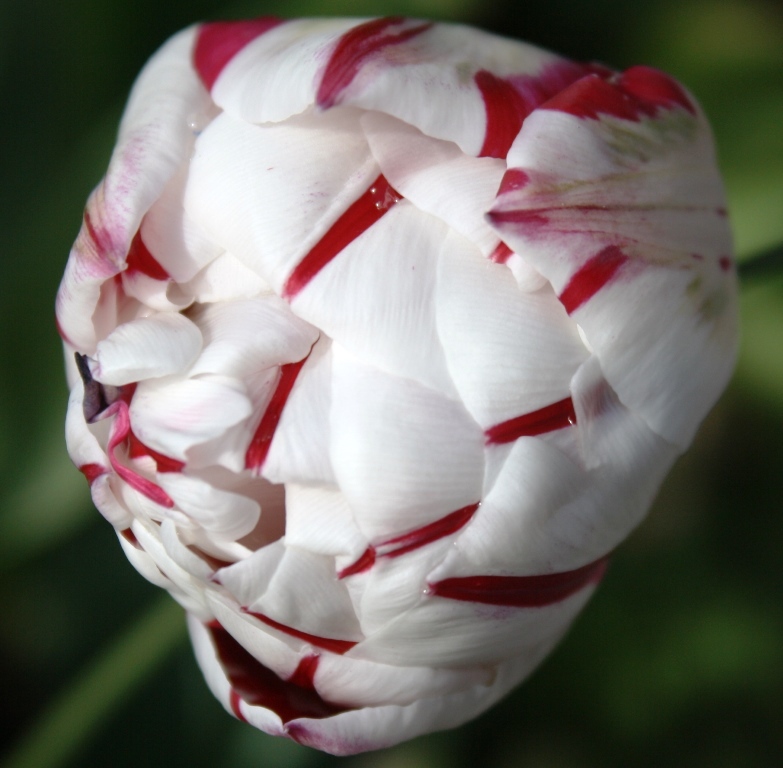 The flowers have delicate white petals and thin stems, which are of a more delicate green than the leaves. If you look closely at the middle of the photo, you can see a spider – an industrious web maker seeking live prey which might venture into the garlic. 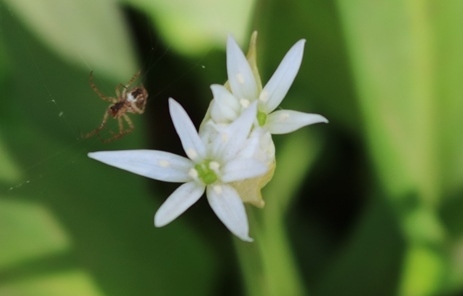 The second photo is a close-up of the spider and the wild garlic flower. Look how the flower head seems to mimic the spider’s legs and how silk-like the nascent web is. When the garlic flowers are fully open, there are swathes of green and white lining the countryside road verges and that, along with the hawthorn bushes and trees breaking into white, transforms the previously dull road edges into rivers of dazzling white. While out on my bike, I listen to downloaded podcasts. I make sure that I can hear the traffic OK while I am listening. So far, my main podcast has been the BBC Radio 4’s Books and Authors. This is made up of two programmes – Open Book which features the mellifluous tones of Mariella Frostrup – and A Good Read which is presented by Harriet Gilbert. The programmes feature new books by a range of authors, as well as two guests discussing books which they recommend to others. More recently, I have been listening to interviews with authors on the The Guardian’s Books Podcast and soon I will be listening to an episode featuring the newly announced winner of the Man International Booker Prize Olga Tokarczuk. The 3rd book podcast certainly worth listening to is from The Free Library of Philadelphia and it features insightful interviews with contemporary authors such as Jesmyn Ward. 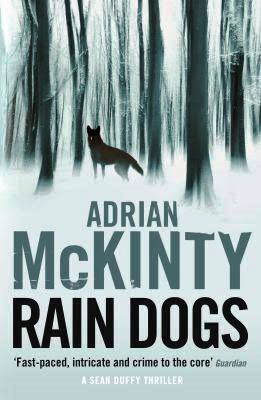 Another podcast which I found recently is the Irish Times Books Podcast and I enjoyed the interview with Irish writer Adrian McKinty, who was talking about his new novel Rain Dogs which I will buy and read soon. A final podcast but not related to books is Death in Ice Valley. This is a fascinating series of podcasts – I have only listened to the first two so far – about the mysterious death of a woman who was found in a remote valley near Bergen in the 1970s. The two reporters look back on the evidence and slowly provide more clues as to who the woman might be and how (or whether) she was murdered. I am hooked, so another episode tomorrow as I tackle some steepish hills on my bike. 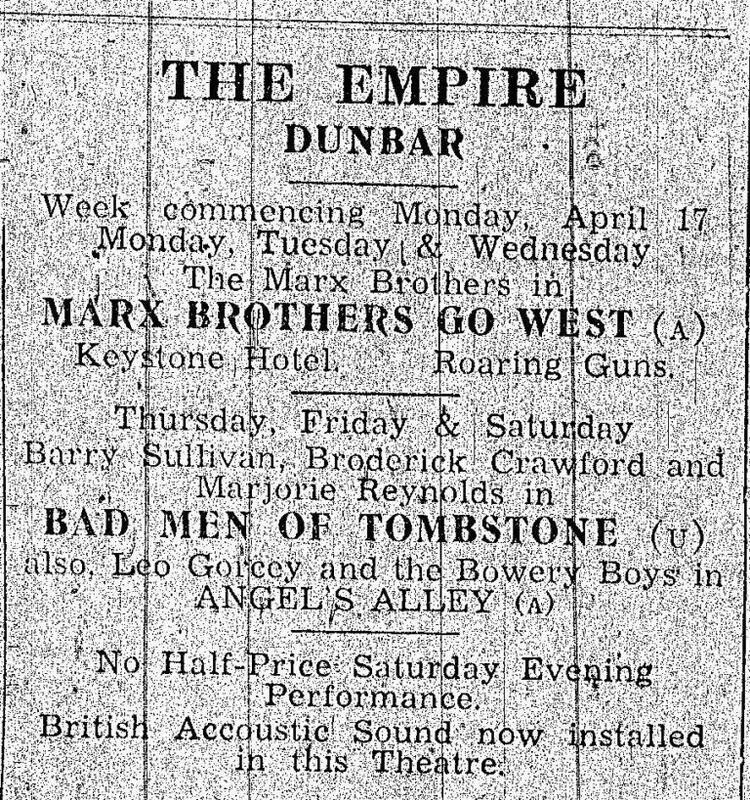 As part of my local history research on my home town of Dunbar in the early 1950s, I’ve interviewed local people on a range of topics including the stranding of 147 whales at Thorntonloch, near Dunbar in May 1950. I’m writing a short local history book on this event and it will examine the press coverage (which greatly exaggerated the number of people who saw the whales), as well as an analysis of the interviews, covering how people got to Thorntonloch,their description of the scene on the beach, how people behaved and their feelings about what they saw, the social aspects of the event i.e. what it tells us about society in 1950, and an examination of why the whales stranded. This week, I interviewed Dr Luke Rendell for the last chapter of my book. 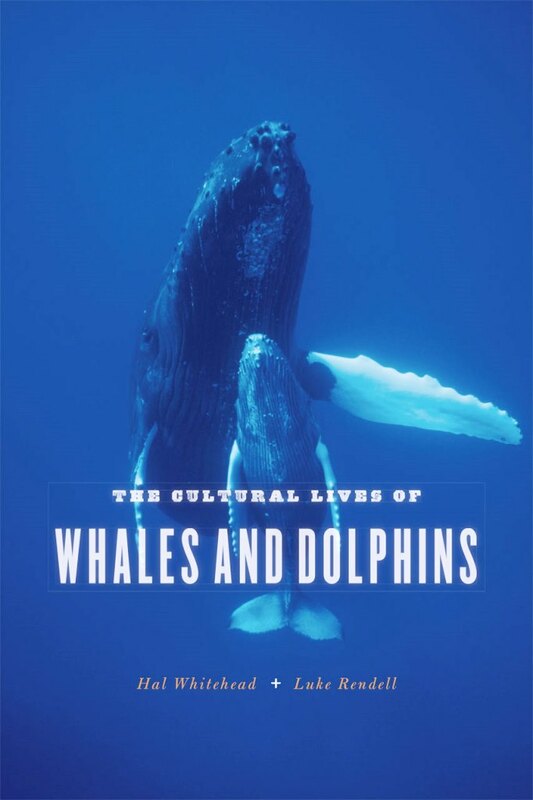 He is an expert on whales and dolphins and is the joint author (with Hal Whitehead) of a fascinating new book, cover below, entitled The Cultural Life of Whales and Dolphins, described in a Guardian review as “provocative, brilliant”. Luke Rendell told me that there was no definitive theory of why pilot whales strand in such large numbers, but that it definitely had to do with the social structure of the whale communities. The authors argue that there is a strong culture within groups of whales and dolphins and that these animals (from the Guardian review) “observe rituals of the dead and exhibit grief”. You can hear Luke talking about whales and dolphins (cetaceans) on Start the Week or download the podcast from April 21st 2015. A new exhibition at SOC’s Waterstone House features 2 artists, Howard Towll and John Busby. I contacted both artists to ask for photos or permission to download and the former got back to me. Howard Towll’s exhibits were very appealing to the eye, with a mixture of wood block and lino block prints. He is also a painter and one of the striking works on his website is Curlew at Dusk – see below. 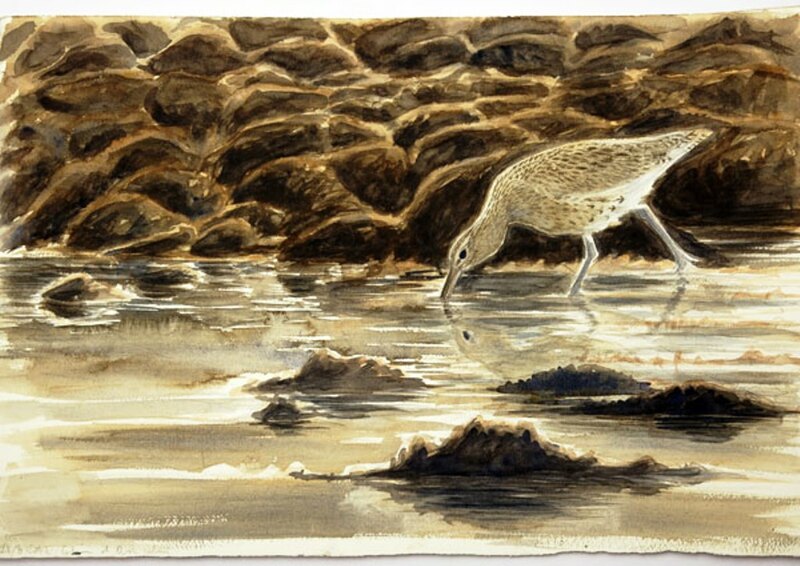 Everything is subtle in this painting, in particular the reflections in the water of the curlew and of the rocks and seaweed. We get quite a few curlews on the rocks at the back of our house and through my scope, I often watch the patiently searching bird, which thrusts its long beach into the rock crevices to seek out food. 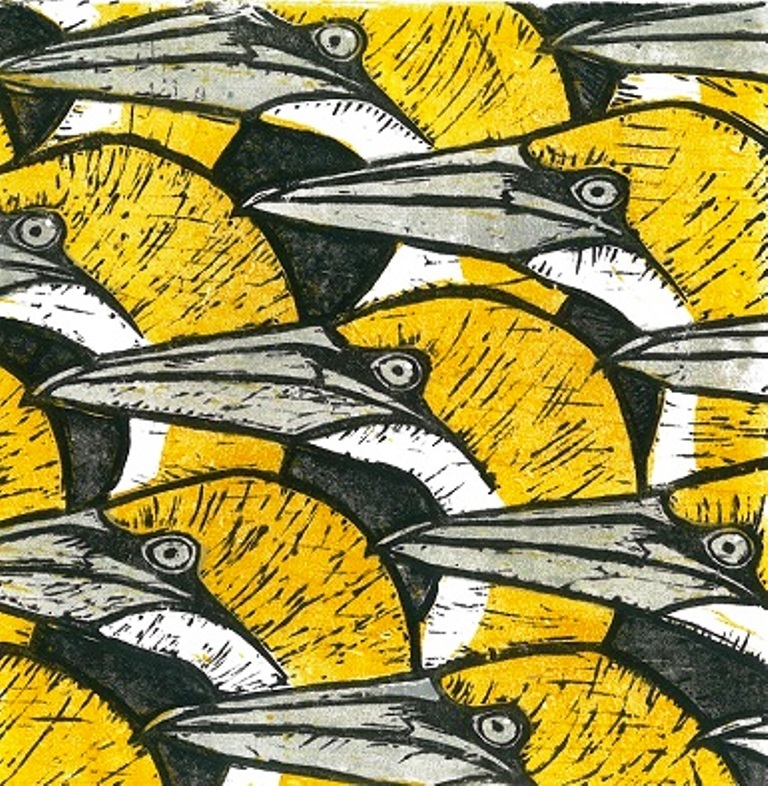 One of the lino prints in the exhibition is Gannet Heads – see below. What I find most intriguing about this print is the sharp lines of the birds and their determined expressions. They could be soldiers marching to orders or runners/cyclists completely focused on winning the race. Looking through my scope, I have just had my first sighting of gannets flying to the Bass Rock this year. My choice of the wood block prints would be Eiders, as these are another species which I often see in the sea around Dunbar. 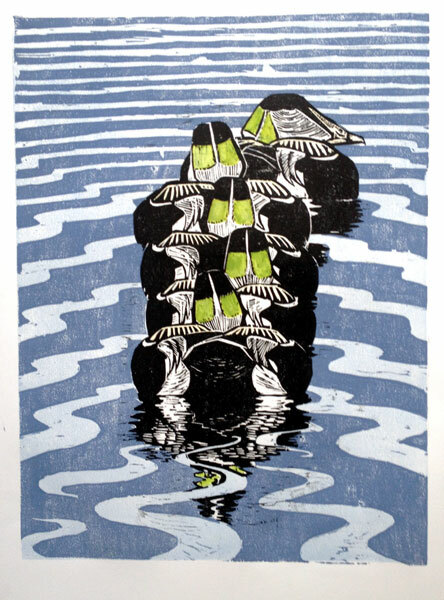 There is an attractive abstract quality to this print, which captures the soft green on the back of the male eider’s neck. The call of the male eider duck is a gurgling, burbling sound and can be heard clearly when groups of eiders are in Dunbar Harbour. While in Dubai, we went to the Dubai Festival of Literature in the plush Intercontinental Hotel. 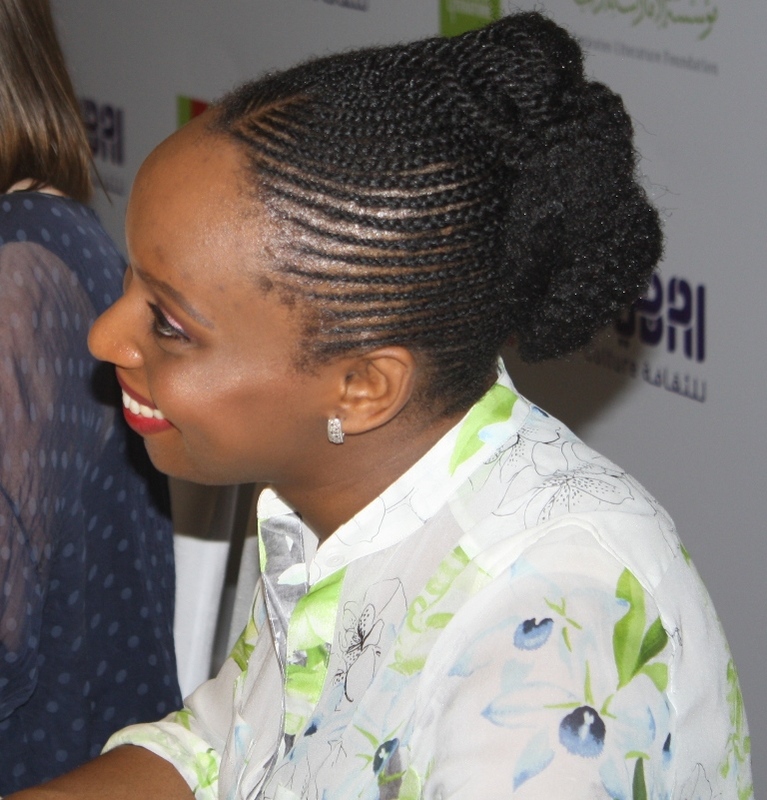 I went to see Chimamanda Ngozi Adichie who was talking about her novel Americanah, which I reviewed on the blog last July. 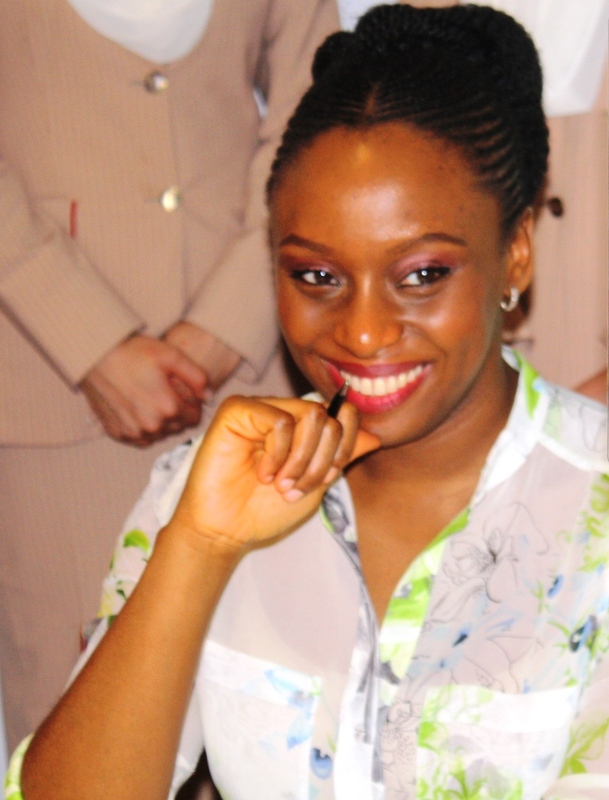 In her interview, Ms Adichie talked articulately and intelligently – and often quite humorously – about the novel’s contents and about her experience of living in America as a black woman. It was a fascinating insight into the novel and she explained that, as a writer, she was two people – the writer as performer on the stage being interviewed, and the writer sitting alone in her room, writing a novel. “These are not the same person” she said. One aspect of the novel which was given much attention, was hair. In the novel, the protagonist visits a hairdressing salon and there is an interesting and amusing discussion of African women in America getting their hair done. She hinted that some of the coverage in the media may have been sexist. This highly intelligent, thoughtful and very attractive writer – who has amazing hair (photos below) – held the audience spellbound for the one hour session. My wife went to see Jenni Murray who hosts Woman’s Hour in the UK and found it a fascinating talk. At the weekend, we paid another visit to the excellent Waterstone House in Aberlady, to see an exhibition of original artist’s prints by Lisa Hooper. This is a varied exhibition, not just in the wide variety of birds on display, but in the different techniques that Lisa uses to such striking effect. The techniques, including Japanese woodblock and paper batik, present the viewer with a range of effects, including some which make the birds stand out on the canvas. 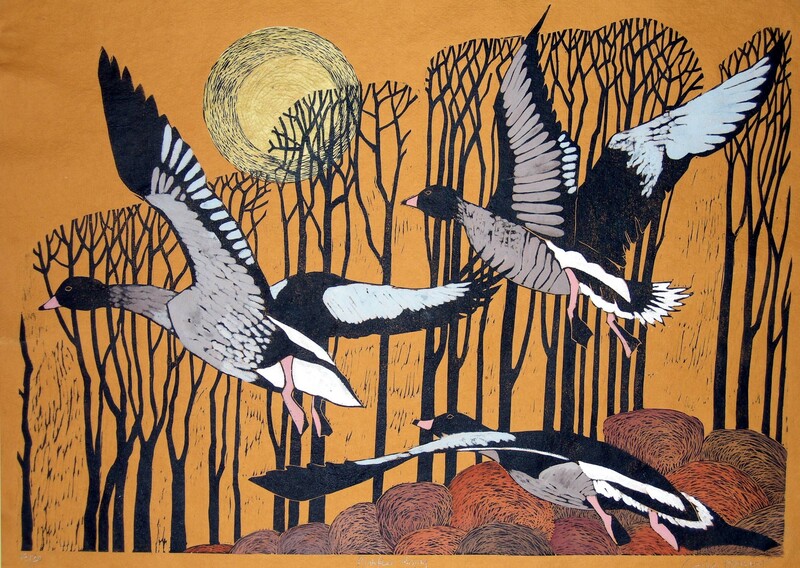 This exhibition has some stunning works, such as Pinkfeet Rising in which the artist presents three pinkfooted geese taking off against a background of stark black trees and a harvest moon. 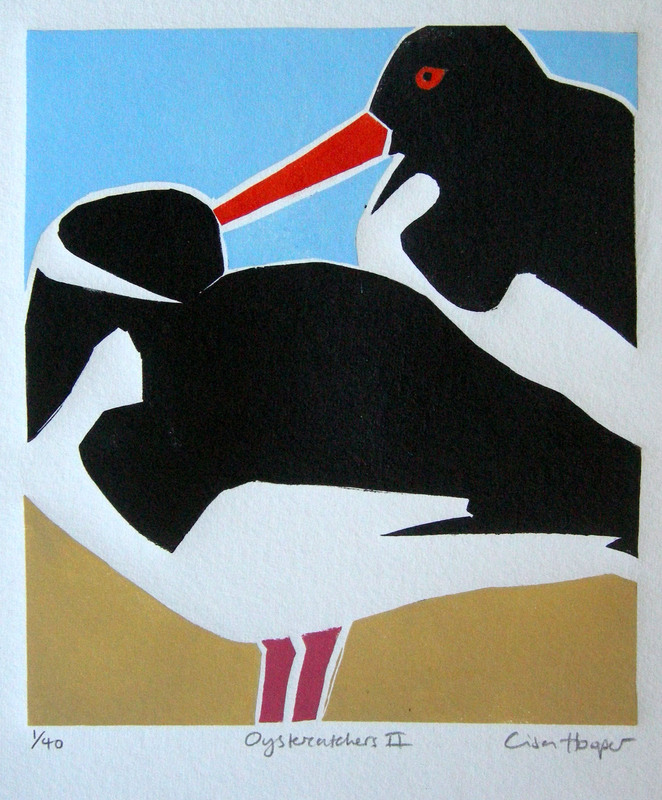 Lisa has kindly sent me 2 photos of her work, Pinkfeet Rising and Oystercatchers and these are shown below. 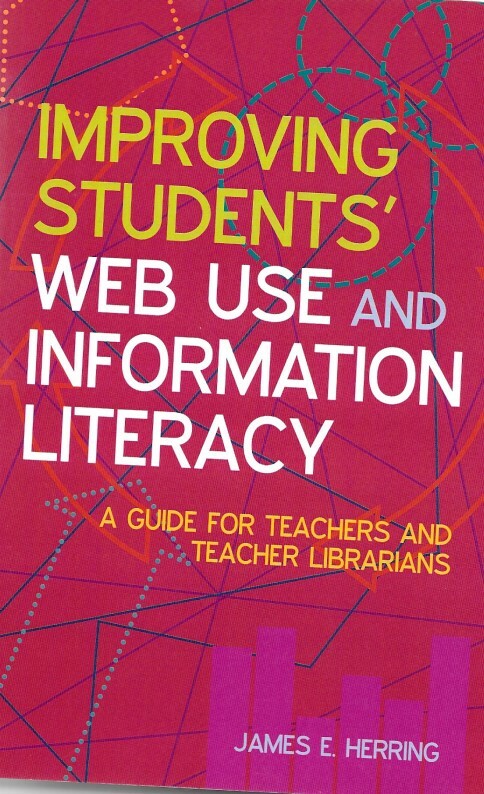 There is a new book by Lisa Hooper – First Impressions – and my wife has bought it for my upcoming birthday. As with my other bird books, I will put the book on a small lectern and turn a page every day. I find that doing this – rather than having the book lying on a table – means that I go through the book slowly and pay more attention to the individual paintings. If you can’t get to the exhibition, visit Lisa’s website and of course, buy the book! Now that it’s October, some of the radio programmes which have had a summer break are back. One of my favourites, which I listen to (safely) as a podcast while out cycling, is Start the Week. The programme has a theme each week and typically features authors who have written books on the theme. This week’s programme (available across the world, not just in the UK) featured guests Karen Armstrong, Justin Marozzi and Christopher Coker who discussed war and religion e.g. is religion to blame for most of the wars in history or is religion used as a cover for the power hungry? There are no right and wrong answers and the listener is presented with a variety views, which may or may not influence what s/he thought about the subject prior to the programme. 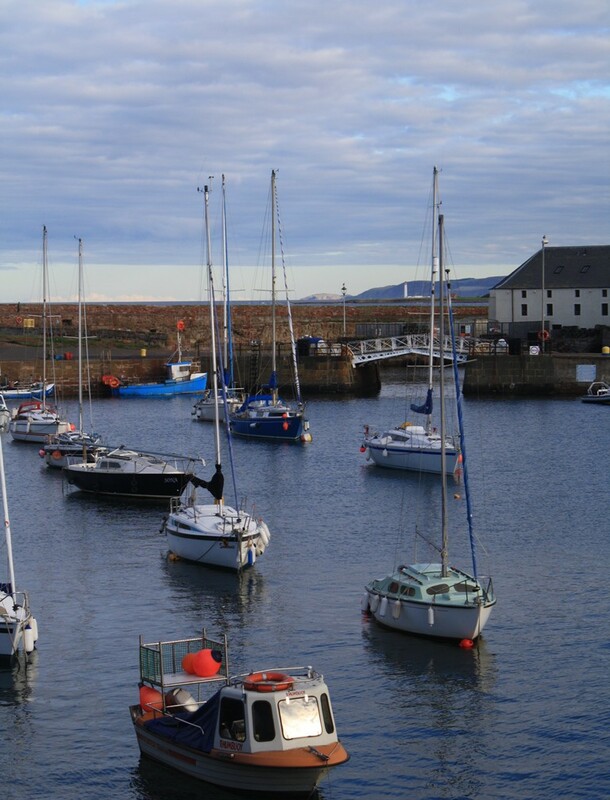 My wife and I regularly walk to Dunbar Harbour, as it is just along the road from our house and I’ve featured the harbour many times on this blog. What we don’t often do, is cross the harbour bridge which separates the harbour from Lamer Island, and walk along the north side of the harbour. 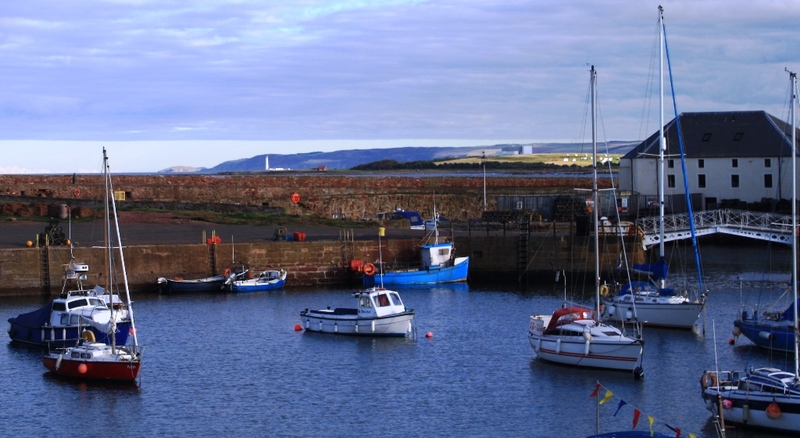 You get a different perspective on the harbour from the north side and, looking back from the end of the pier, just across from Dunbar Castle, you notice that the small yachts in the harbour are facing you directly, and that you can see past the harbour, giving you a view of the Lammermuir Hills. The photos below show the harbour at its best – on a warm, sunny September evening. 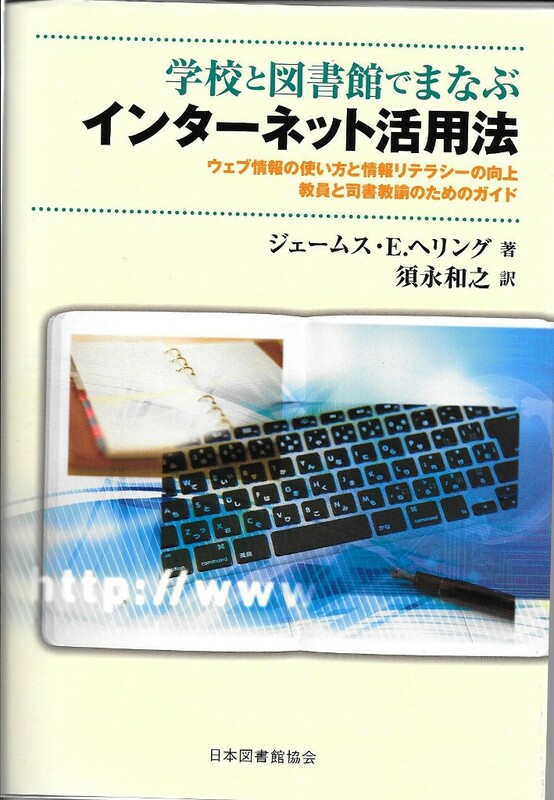 I have just finished reading The Forward Book of Poetry 2014. 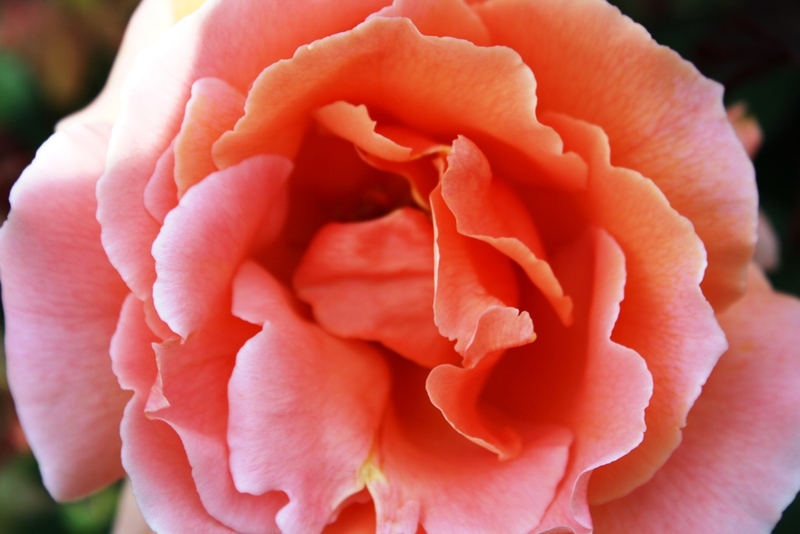 It’s an annual collection of poems submitted for various elements of the Forward Prizes. 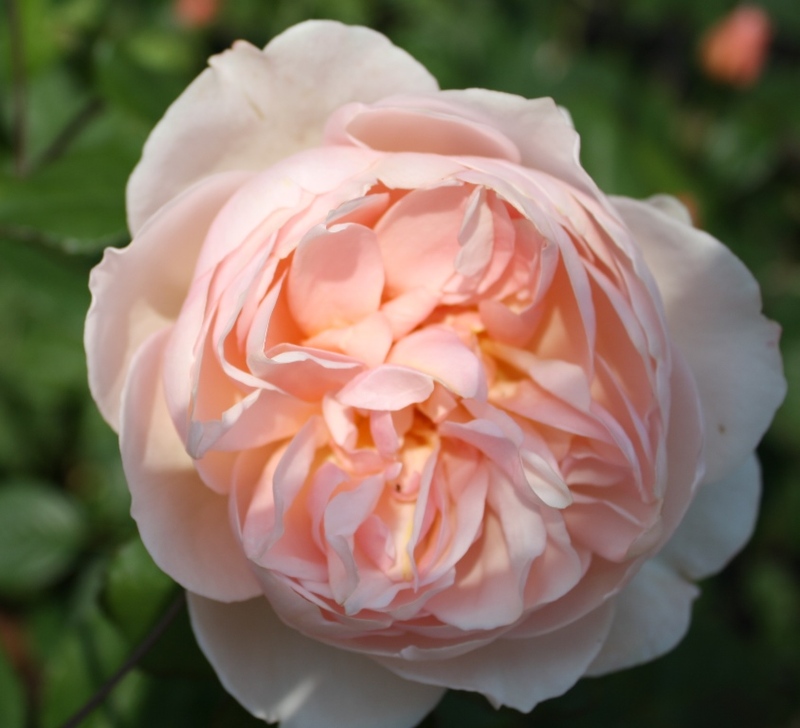 The best collection was by Michael Symmons Roberts entitled Drysalter which I’ve referred to in the blog. Taking the book off my bookshelves and opening it at random, I find Discoverers including the lines “History as layers of paint, sedimentary/ and underneath them all, spread/ like a painless contagion, stone”. The best first collection prize went to Emily Berry for Dear Boy, which includes the truly original prose poem “The International Year of the Poem” in which the poet imagines poems being seen as internationally subversive and governments taking action e.g. an Israeli prime minister stated that “We have now declared war on the poems of Gaza….we will treat the population with silk gloves/ but we will apply an iron fist to poems”. If you don’t normally buy poetry books, buy this one and read one or maybe two poems a day – your imagination will be richly stirred. For the last 10 days, the east of Scotland and most of the east coast of England has been covered in low cloud, with the occasional slow inrush of haar (sea mist) and the temperature has hung about 6 or 7 degrees. At times, it reminded me of Cormac McCarthy’s sentence at the beginning of his novel The Road – “Like the onset of some cold glaucoma dimming away the world”. Now in The Road, the world has suffered a disaster – possibly nuclear war – and the sun has been permanently blocked out. The sun will return next week here but the image of a “cold glaucoma” is startling. Despite the ubiquitous grey in the sky and on the sea, my spring garden provided some relief and welcome colour, in the form of wallflower. 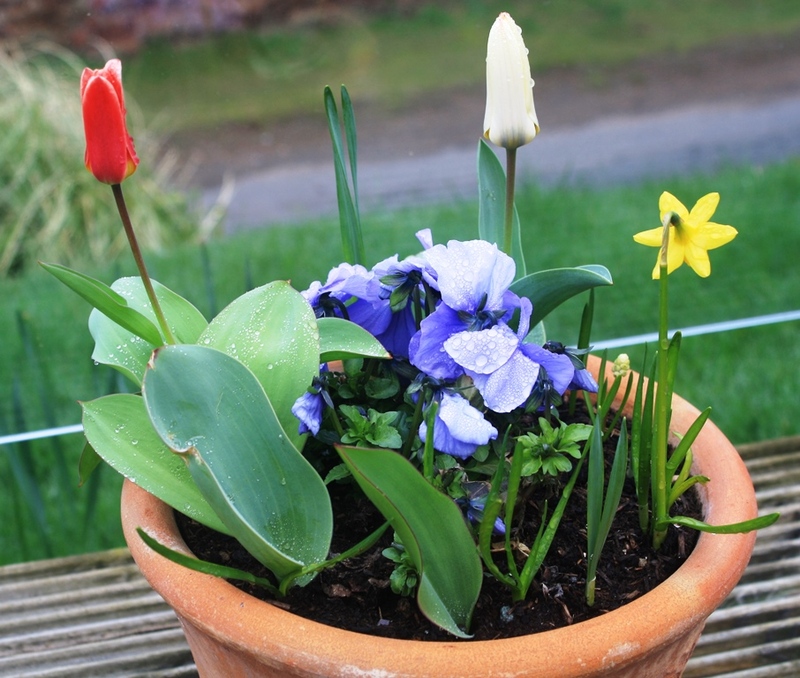 grape hyacinths, daffodils and tulips in the 1st photo below. 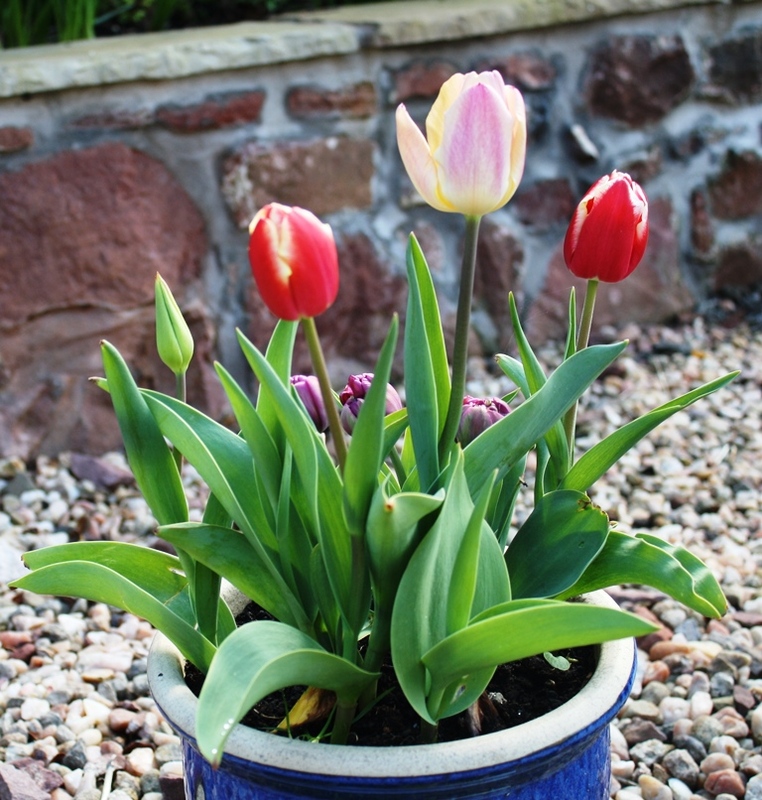 The 2nd photo is a pot with pansies, red and white tulips and daffodils. 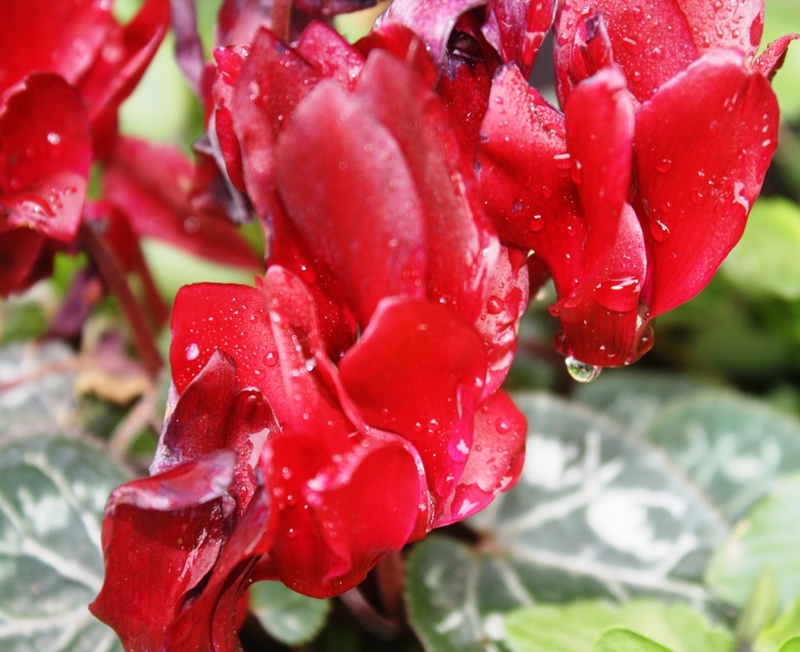 The 3rd photo shows the aftermath of the rain on a cyclamen plant. Out on my bike this week, I listened to an episode of In Our Time, the weekly radio programme hosted by Melvyn Bragg on free will. This episode is from the programme’s archives. It was a fascinating discussion and it did not get too bogged down in terminology. Proponents of free will argue that we have freedom over our actions – will we choose the chicken or the fish in a restaurant? – although this is not complete freedom as our choices will be influenced by factors such as societal pressures, our experiences and our tastes. Opponents of free will – the determinists – argue that everything we do is determined e.g. by nature or by divine intervention, so we cannot have free will. However, if everything is determined, why don’t we just act as we like, possibly irresponsibly, as what we do is determined anyway? Some philosophers argue that if we have moral responsibility for our actions, then we don’t have complete free will but they also reject determinism. As with all things philosophical, there are many arguments and counter arguments e.g. we must try to define “free” and “will” before we can discuss it. So, while it looks like you have free will with regard to reading this blog post or not, you don’t make that decision uninfluenced. In my poetry calendar on Wednesday, was John Fuller’s Seal at Carreg Ddu. It compares the look of the seal on the rocks “like a half blown balloon” and the female seal “waddles to the waves,/Kilos of whiskered blubber”. The final verse is even more precisely descriptive and animated: “But look! Once in the water/Like a bullet she is free,/All muscle, all shoulders/Tunnelling through the sea. Fuller’s use of the word tunnelling makes this, for me, a great poem. 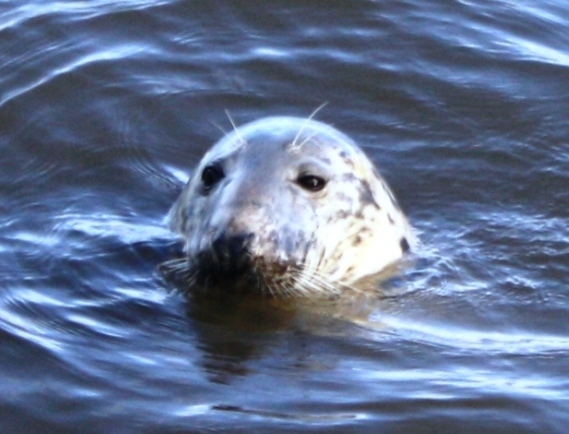 In one word, he creates a video for the reader – of the seal arrowing through the water. If the seal was a huge earth moving rotator, it would be a speeded up form, creating a tunnel in seconds, instead of months. Carreg Ddu is an island off the coast of Wales. My poetry calendar ran from 2011 t0 2013 but I still turn the page every day. I might have a go at creating my own online poetry calendar – watch this space. 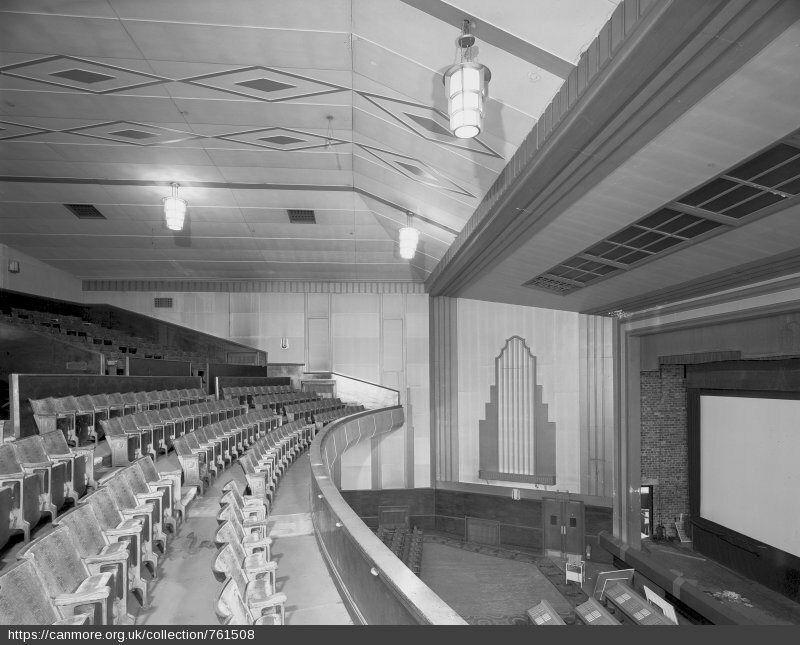 Photo 1 has appeared on the blog before but it’s worth including again. My cycling mate John, who has five bikes in his sheds, is a strong advocate of not selling your present bike when you buy a new one. Why? Well, just in case… What if … You never know the day… We only have garage space and as of last night, there were my two road bikes, my mountain bike and my wife’s bike. I decided to sell my older road bike. 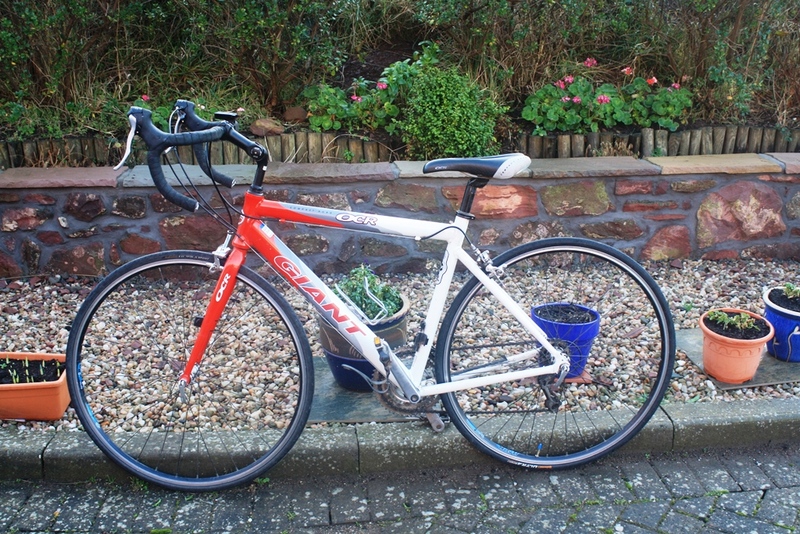 I advertised it on Gumtree and within an hour, I had a query about the bike frame size (you measure the length of the seat tube). I replied and got another email asking if James (from Dunfermline) could come to see the bike. He arrived at 8.30pm and bought the bike. He even sent me a text today, saying that he had just completed his first proper bike ride on the Giant OCR and he thought it was brilliant. How good was that? Here is what James bought for (an absolute snip at) £150. Out on my new bike earlier in the week, I listened to a download of Start the Week – a Monday morning radio programme, in which there is usually a panel of people discussing a topic (e.g. nationality, culture, history etc). 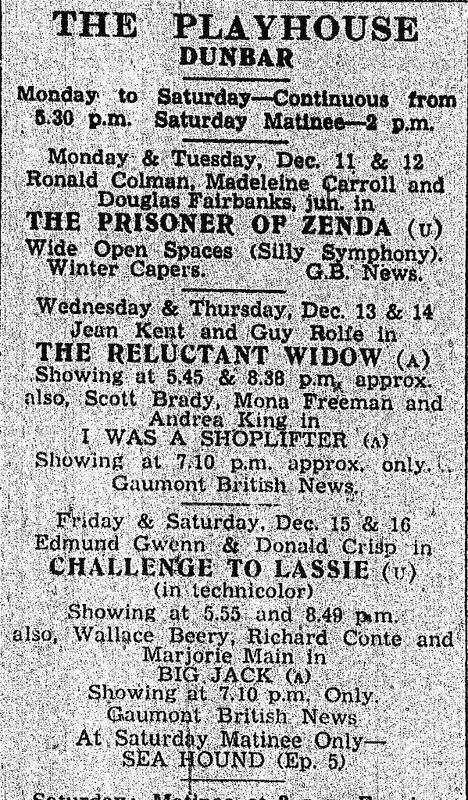 I’d missed the programme over the festive period but was delighted to see that, when I scrolled down the episodes, there was a whole show devoted to an interview with Clive James. This writer – of prose, poetry and journalism – and broadcaster on TV and radio, has been a favourite of mine over four decades. I first started reading him when he was the TV critic of The Observer a UK Sunday newspaper. Some of his funniest articles were on the US TV series Dallas, about rich oil men and their shenanigans with oil and with other people’s wives. James’ keen ear for dialogue and pronunciation was brilliantly illustrated in the article Someone shart JR . In the article, Sue Ellen keeps her gern in a drawer and James ended the section by writing “Don’t be surprised if the sheriff turns up with a wornt for her arrest. There could be a tornt of wornts. ” He is also a very accomplished poet, so check out the radio programme and make an extended visit to the Clive James website. It is now one hundred years since the publication of D H Lawrence’s Sons and Lovers and those wishing to learn more about this remarkable novel – or to relive the pleasure of reading it or studying it, would do well to read Blake Morrison’s article in the Guardian and listen to the Guardian podcast part of which discusses the novel. Morrison’s article is particularly insightful, quoting a range of reviewers and writers who identify Lawrence as one of the greatest English writers (and writers in English). The novel was censored by the publishers in parts, mainly because of its sexual content. The cuts made seem trivial to today’s readers e.g. a scene where Paul Morel, the novel’s protagonist, goes up to Clara’s room and puts on a pair of her stockings was cut totally. This was an Edwardian society where sexual acts and fantasies were not to appear in print – for a variety of social and religious reasons. I studied Sons and Lovers (free ebook available) as an undergraduate and found it engrossing. A recent visit to the National Gallery in Edinburgh to see an exhibition by the 19th century north American painter Frederic Church. The first example on display is a huge painting entitled Niagara from the American Side which shows the artist’s skill in displaying not only the action of the falls but the range of colours to be seen. The other paintings how Church’s ability to paint rural scenes. One of the highlights for me was Church’s paintings of clouds and the exhibition’s notes comment that cloud painting is often found very difficult by most artists. A very enjoyable visit and well worth repeating, as the exhibition is on until December. If you’re not near Edinburgh, then check out Church as an artist. 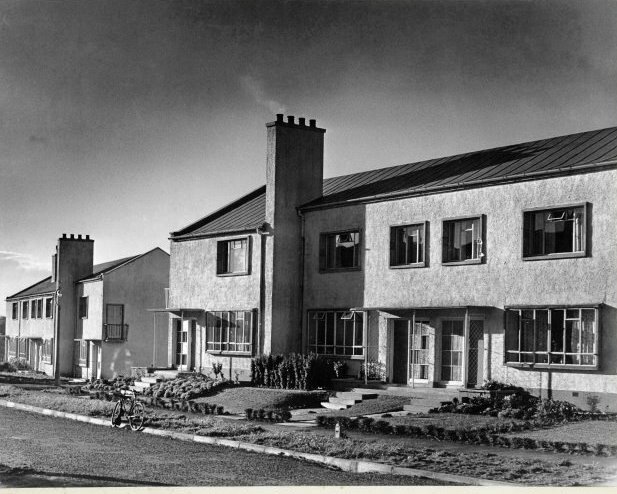 Last week, a nostalgic trip for my wife and me to Kemnay in Aberdeenshire, where we lived for 9 years from 1978 to 1987. We stayed with friends with whom we have kept in touch over the years and whose sons were great friends with our sons. 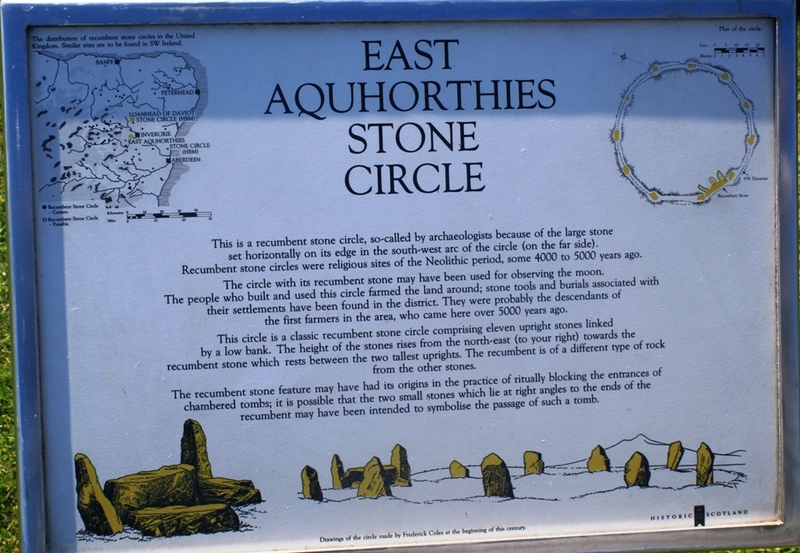 One of the iconic places to which we took our boys, as they were then, was the Easter Aquorthies Stone Circle. Photo 1 shows the information display at the site and notes that the stone circle was built between 4000 and 5000 years ago. The stones are large and I always find it interesting to lay hands on the stone, in the knowledge that people 5000 years ago also lay hands on these stones. 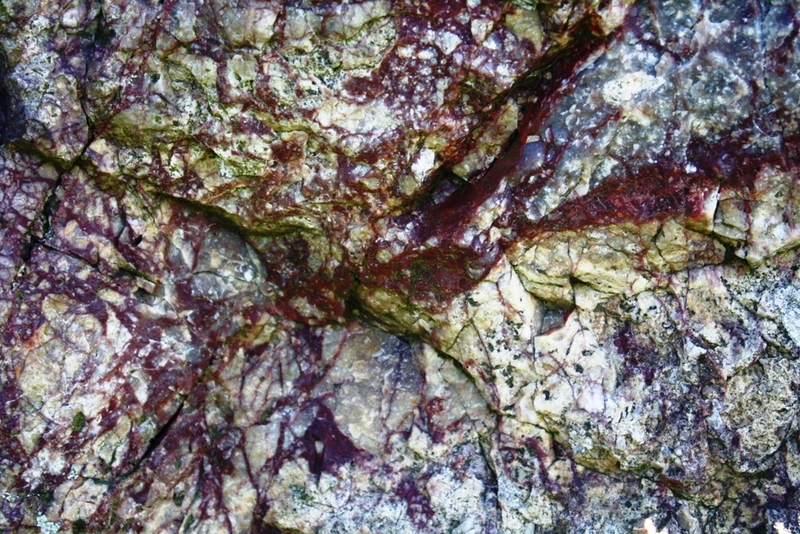 Photo 2 shows the circle in full and Photo 3 is a close up shot of one of the stones, which appears to contain marble. 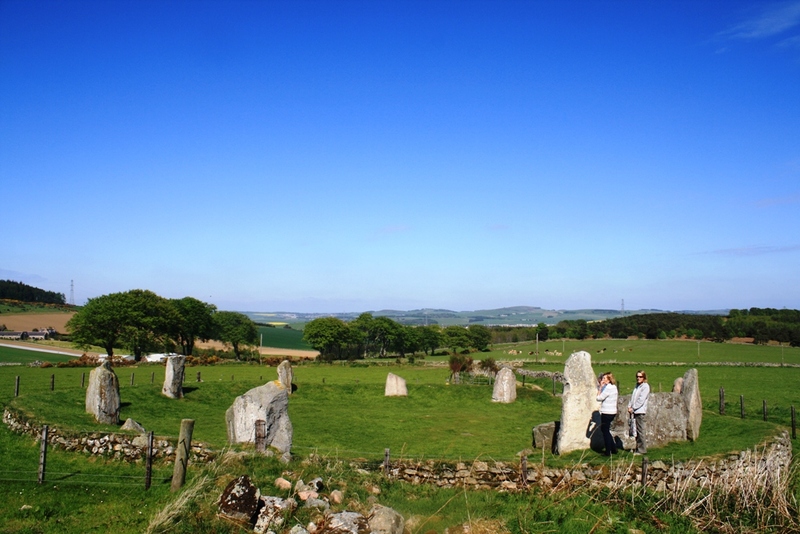 You can let your imagination fly at this stone circle and try to picture the construction of the site, the possible reasons for building the circle and the relative poverty of those involved. By modern standards, these people would appear primitive, but their vision in erecting these stones in this way, can be seen to surpass many modern constructions. When my wife and I were in Dubai, we were treated to a gourmet experience at the Table 9 restaurant. Table 9 is run by 2 young chefs who used to work for the (in)famous chef Gordon Ramsay. It’s a very pleasant restaurant, not at all pretentious, and the service is excellent, but it is the intensity of the flavours in the food that stands out. I had the taster menu and swapped the veal for scallops, plum and seaweed, which sounds an odd mixture, but the scallops were done to perfection and came on a bed of fine seaweed, on a base of intense plum sauce. While the scallops were excellent, for me the key highlights were the lobster dish – lobster, coconut and mango (see 1st photo – sent to me by Table 9) . I talked to Nick Alvis, one of the chefs after the meal and he agreed to send me a photo and a description of a couple of the dishes. The lobster dish is “Lobster marinated in chip shop curry sauce. Coated in roasted coconut with fresh mango and coconut cream puree.” All I can say is that they must have found a fabulous chip shop. The flavours in this dish hit you one after the other. 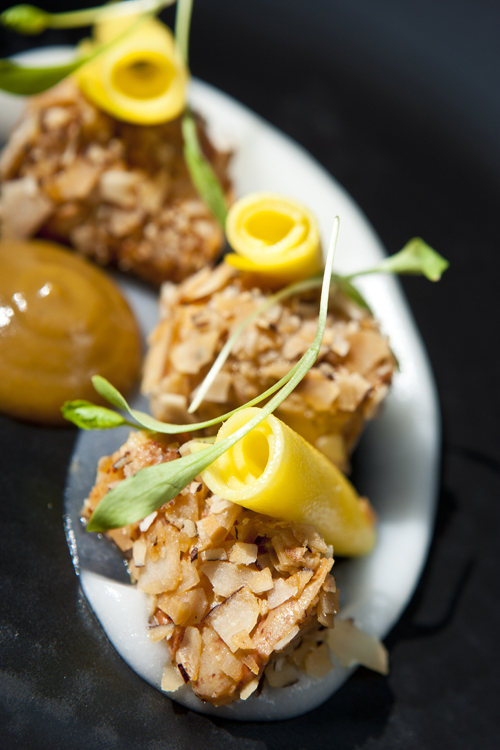 An excellent culinary and artistic touch is the mango – what you think might be pasta in the photo. The other highlight for me was the lamb – “Lamb, smoked aubergine, scratchings, tomato: Smoked aubergine + raisin puree, plum tomato chutney (vinegar, sugar, shallots), large leaf spinach, lamb belly scratchings and lamb dressing (roasting juices, vinaigrette, lamb fat and lamb stock) – a range of mouth watering tastes all in one dish. This is a treat and a fairly expensive i.e. one to save up for. Back home and from 31 degrees and wall to wall sunshine in Dubai, back to 2 degrees and a biting NE wind and snow. 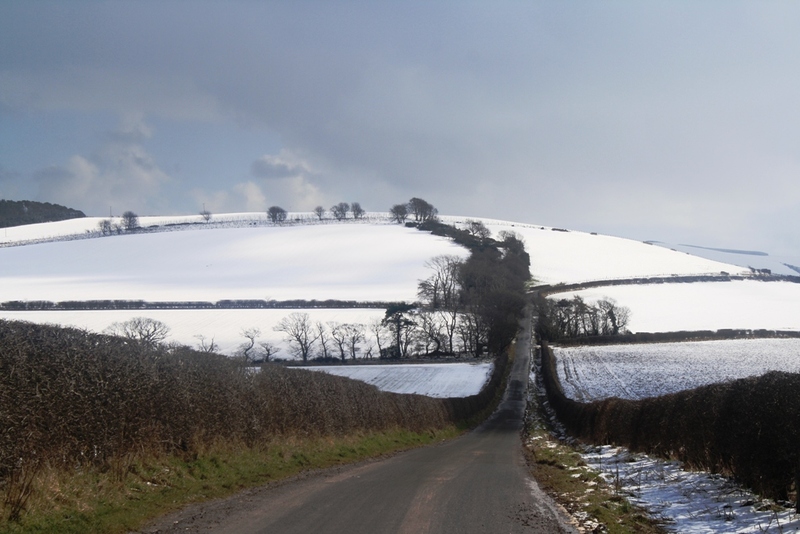 I took my wife Val up the hills for her morning run – slightly more sheltered up the hills. 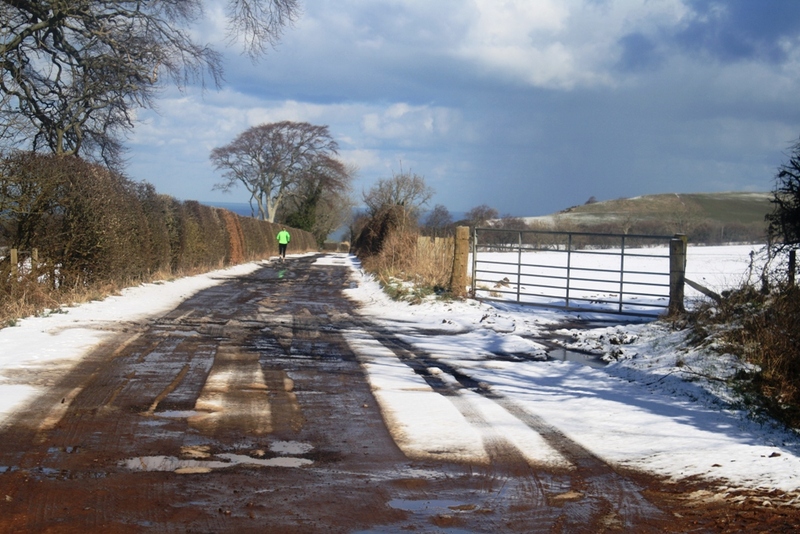 Snow here in the morning melted but a few inches up the hills (see 2nd photo), so a muddy and snowy run (see photo 3). Too cold for me to go on my bike, so I went to the gym. I do this only in desperation as I find the gym very confining and even with downloaded Guardian short stories and Thinking Allowed to distract me, it’s always a long slog. Back at the house, with camera still in hand, I photographed some of the small daffodils which are now out in my garden (see photo 4). 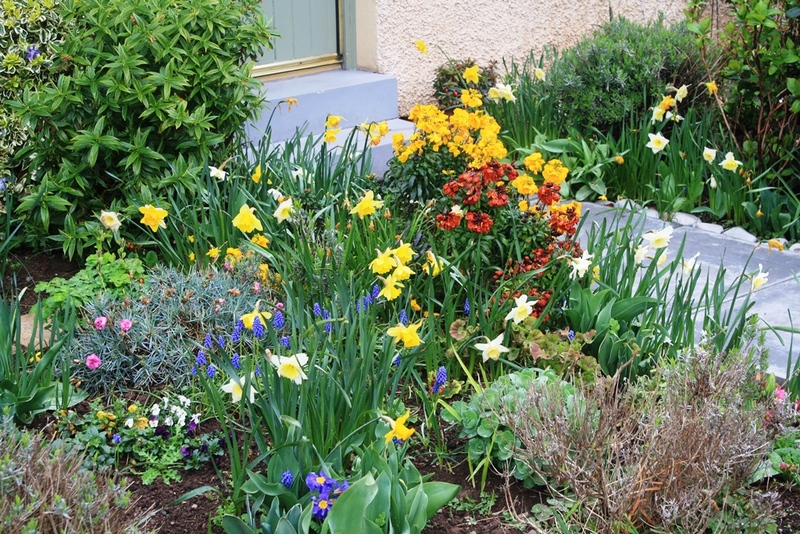 There’s poem I like by Alicia Ostriker called “Daffodils” and she writes ” I’m photographing the yellow daffodils/ With their outstretched arms and ruffled cups”. 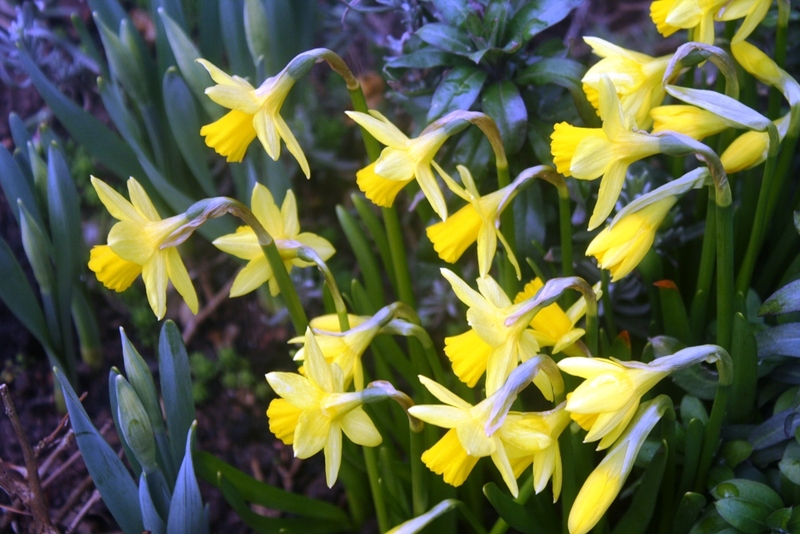 Daffodils always remind me of open mouthed choirboys with ruffs on their necks. 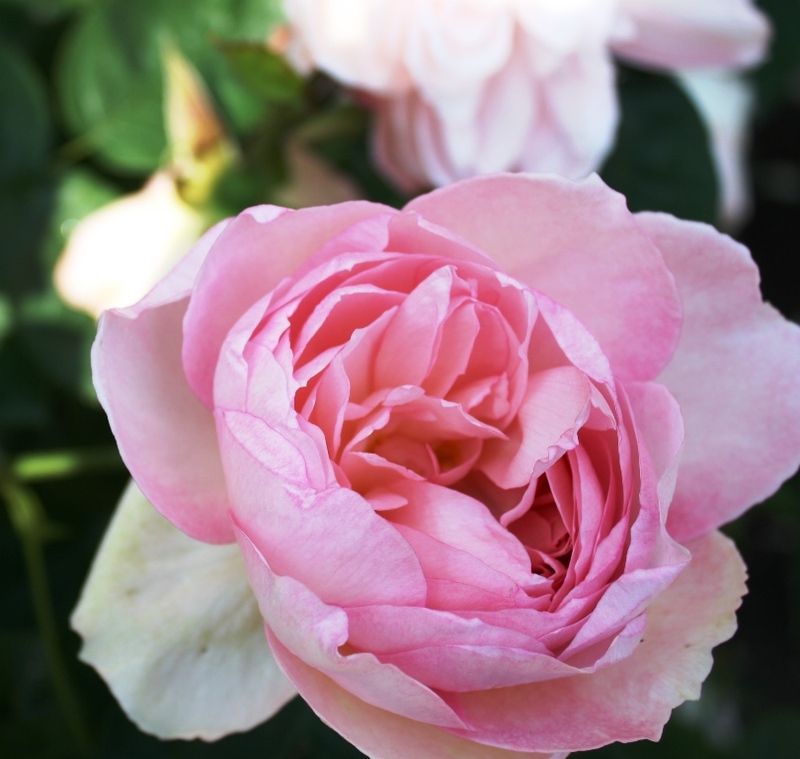 They always have their heads slightly bowed, and appear to me to be diffident flowers, not wishing to be showy, despite their obvious beauty.